Spam, UBE or abusive email represents 90 billion messages per day, accounting for more than 70% of all email traffic. Research firm The Radicati Group forecasts the spam percentage to increase to 82% by 2011 despite all efforts. It's estimated that spam accounts for about two-thirds of corporate e-mail traffic, which makes corporate IT staffs face extra costs, resources and security risks. Phishing has rapidly grown its share to nearly 80% of all email-borne threats, greatly exceeding executable malware such as viruses. 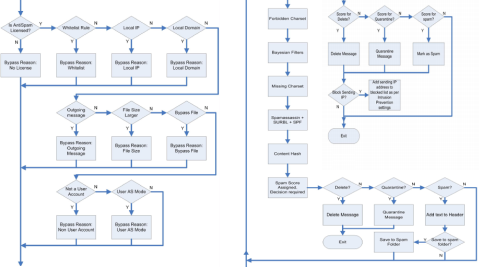 Processing flowchart shows some of the sophistication behind anti-spam internal logic. Its modular design allows fast adoption to new spamming methods. IceWarp Anti-Spam is a complete solution approaching 100% accuracy. It is the most developed subsystem, practically on a daily basis the engine is improved to handle the latest spammer tricks. New rules, spam signatures and engine changes are downloaded and installed transparently through AutoUpdate technology, in response to the ever-changing spamming methods. To reduce false positives rate without decreasing Anti-Spam efficiency, email from unknown senders which cannot be clearly deemed spam or ham can be quarantined. Manual spam processing means that the end user can inspect a quarantine report sent on a daily basis and whitelist senders of messages accidentaly tagged as spam. Semi-automatic processing can be achieved by deploying Challenge Response- senders of quarantined messages will need to authorize themselves by completing C/R confirmation. Automatic building of whitelists allows to tighten email delivery by engaging all available Anti-Spam technologies, without the fear of losing an important message. Closed working groups can achieve 100% spam-free email without much effort. Messages from your business contacts and people you've been in touch with will never be tagged as spam. Email from whitelisted addresses will be delivered straight to user's mailbox, completely bypassing anti-spam processing.